Heat oven to 425°F. In medium bowl, cut 3-oz package of cream cheese and the butter into Bisquick mix, using pastry blender (or pulling 2 table knives through ingredients in opposite directions), until mixture looks like fine crumbs. Stir in milk and egg yolk. Place dough on surface well dusted with Bisquick mix; gently roll in Bisquick mix to coat. Knead 10 times. Roll dough into 16x8-inch rectangle. 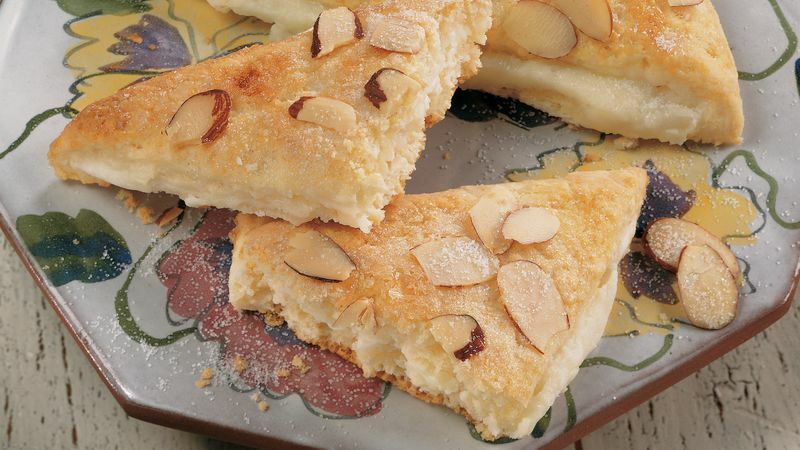 In small bowl, mix 8-oz package of cream cheese, 1/3 cup sugar and the almond extract until smooth. Spread cream cheese filling lengthwise over half of dough to within 1/4 inch of edge; carefully fold dough over filling. Brush egg white over top. Sprinkle with almonds and 2 teaspoons sugar. Cut into 4 (4-inch) squares; cut squares diagonally in half to form 8 triangles. Place on ungreased cookie sheet. Bake about 14 minutes or until golden brown. Serve warm or cold. Cover; refrigerate any remaining triangles. You can use vanilla instead of the almond extract in the cream cheese filling.